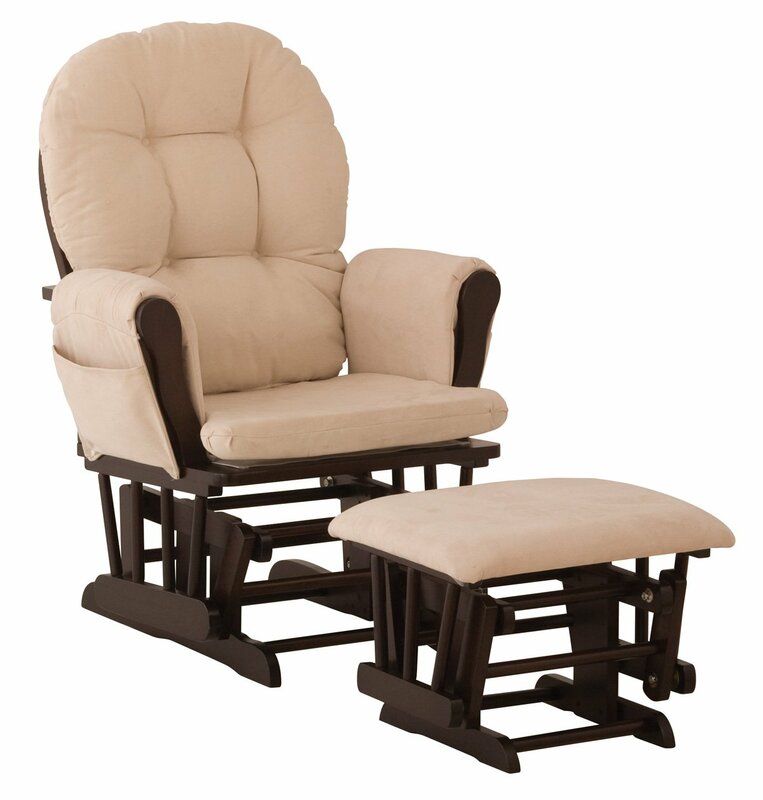 before you decide which glider rocker chair you wish to have in your nursery, here is a summery of the pros and cons of Wooden vs Upholstered Gliders. There is no ‘best glider’ because each family has different needs. There are questions you should consider to ask yourself before you decide which glider chair is best for your needs. How big is the nursery room? If it is small, a wooden rocking chair would be a better choice. If the nursery room is large than there is no problem positioning an upholstered glider which takes more space. Do you have toddlers or other babies in the family? Small children who crawl, may get their fingers caught in the moving parts of the wooden glider. All the moving joints are at their reach. An upholstered rocker has a skirt all around the bottom part, so there are no immediate way fingers could be caught. Upholstered gliders are safer furniture. What is your weight? If you are overweight, or your pregnancy pounds have not been lost yet, a wooden glider chair may not be able to support your needs. The wooden gliders have a narrow seat compared to upholstered chairs. Upholstered gliders are better for overweight people. Nursery room design? Do you have any design in mind for your nursery room? A wooden glider chair + ottoman, look differently than an upholstered rocking chair with an ottoman. The upholstered are much more elegant and classic, they are a furniture with presence, the wooden gliders are slim and narrow, and look less luxurious than the upholstered chairs. Glider and swivel vs back and forth rocking? Do you have any preferences? Wooden gliders rock back and forth, the upholstered furniture have more possibilities like swivel and recline positions too. So there is more options to sleep with a baby or feed a baby while seating on the glider. Keep or sell the furniture? If you purchase a wooden glider once the baby has grown there is not much use for the glider. Most wooden gliders do not match to the living room furnitures, they are a baby room set. Upholstered chairs have cushions and covers which make them blend better into the living room decor. This double cushion glider offers maximum comfort. The poly-filled cushions are soft yet firm enough to offer you great support and relaxation. Perfect spot for late night feeding with baby. Great place to relax with baby and comfy enough for a quick nap. The glider swivels, glides and rocks. Best selling glider and ottoman at Amazon! Thousands of Hoop Gliders have been sold, 90% of the ratings are positive! Spot cleanable cushions, keeping the look clean and fresh all year long; Matching ottoman include. This entry was posted in Gliders & Ottomans and tagged Glider & Ottomans For Overweight Parents, Upholstered Glider & Ottoman Set, Wooden Glider & Ottoman Set, Wooden or Upholstered Rocking Chair, Wooden vs Upholstered Glider by dekel. Bookmark the permalink.